Let’s start with some observations that have been established by the research community for some time. Functional Magnetic Resonance Imaging (fMRI) and CT (Computerized Tomography) machines track ADHD brain activity in real time, rather than the older scanning technologies which were only capable of taking snap shots. From these brain scans, scientists have seen that people with ADHD have smaller prefrontal lobes, the part of the brain responsible for executive functions such as reasoning, planning, and problem solving. In general, it’s around 10 % smaller. Also, researchers have well established that the anterior temporal lobes, caudate nucleus, and globus pallidus are smaller too. The smaller right frontal lobe is thus probably responsible to some degree for inattentive behavior since the right side of the brain is involved in the attention process. Impulsivity and stimulus processing are also believed to be moderated in that region. An excessive amount of grey matter in the inferior parietal cortices of the ADHD brain contributes to abnormal brain chemistry in an individual as well. 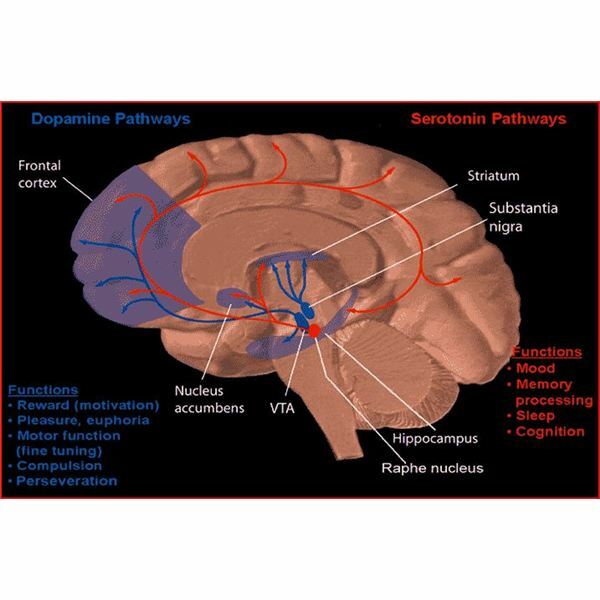 The results of a study published in the September 9, 2009, issue of the Journal of the American Medical Association revealed that people with ADHD had lower levels of dopamine transporters in the brain's reward center than the control subjects. These proteins are involved in reward and motivation systems and lower than normal levels may explain some of the common symptoms of ADHD such as reduced motivation and inattention. 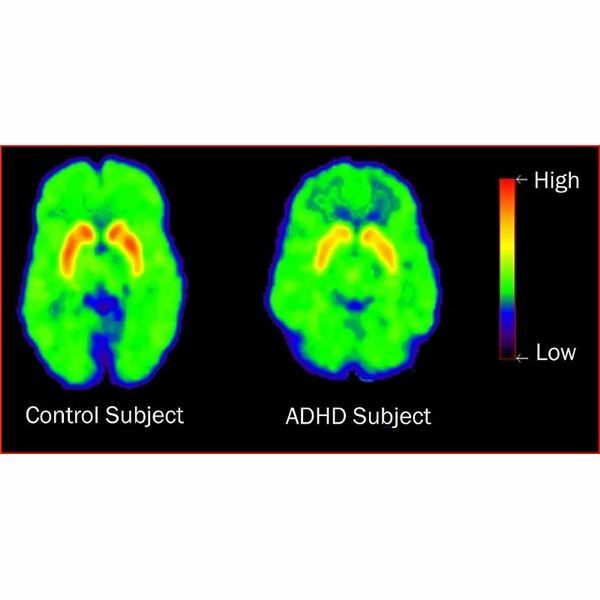 Using multiple PET scans to monitor dopamine transporters and receptors, the researchers looked at 53 adult ADHD patients and 44 non ADHD control subjects. They found lower levels of transporters and receptors in the accumbens and midbrain. This, coupled with clinical observations of behavior led them to the conclusion that these deficiencies attributed to these common ADHD symptoms. Therefore, ADHD people have an inability to associate certain stimuli to reward. We can easily see then why their troubling behavior persists as if they had no care or concern for how it might affect people around them. It is also why ADHD sufferers might be more prone to substance abuse and obesity. A study published in the Proceedings of the National Academy of Science reported that certain brain regions in children with ADHD actually matured later than non affected children. A team of researchers from the National Institute of Mental Health took multiple snapshots of children's brains at regular intervals as they grew to adolescence. The snapshots were then converted to time-lapse movies to track developments over a large period of time. Researchers observed regions in the middle of the brain, essential to attention and control, maturing last. The telling event in this study was the age at which the brain's gray matter reached what is known as peak cortical thickness. For the mentally healthy kids the age was around seven or eight while the ADHD kid's brains didn't reach this critical stage of development until they were about ten. The immaturity in the brain thus points to typical behaviors in ADHD children, particularly hyperactivity and inattention. These findings are hopeful on two fronts. First, the researchers found that many ADHD-afflicted brains did eventually catch up with the maturing process. The researchers couldn’t posit a reason as to why some ADHD kids would still display symptoms well after their brains had matured. The crowning jewel of this study was the realization that the earlier a child is diagnosed with ADHD, the more that can be done to ensure they receive the most effective ADHD treatments to help them successfully navigate their youth.